Step 1. Put the wrap on baby’s back with one short end and one long end. Step 2. 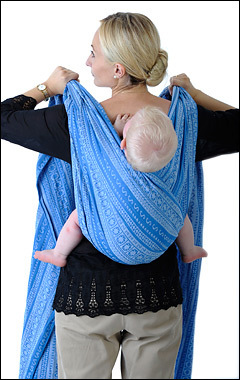 Put baby on your back with the wrap. Step 3. Bring the short end of the wrap over your shoulder and the long end underneath. Step 4. 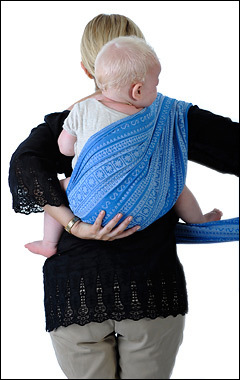 Bring the long wrap end under baby’s leg and around your waist in the front to create a bunched waist belt. Step 5. Continue bringing the wrap around to the back under your baby’s first leg and then spread up across baby with the bottom edge of the wrap spread from knee to knee. Step 6. 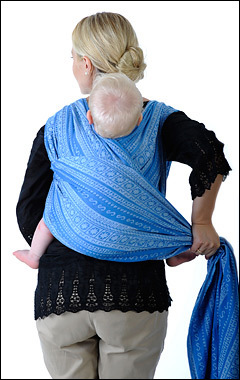 Bring the wrap over your opposite shoulder so baby is supported in two cross passes. Step 7. Bring the same (long) wrap end straight down under your arm to create a rucksack strap. Step 8. Spread the wrap straight across baby’s back in a horizontal pass with the bottom edge coming from knee to knee helping to form the seat under baby. Step 9. Bring the wrap under your arm (do not tuck under baby’s leg). Step 10. Tie the two wrap ends in a knot at your shoulder. Step 11. Tying a slip knot is optional and allows for easy tightening of the carry.